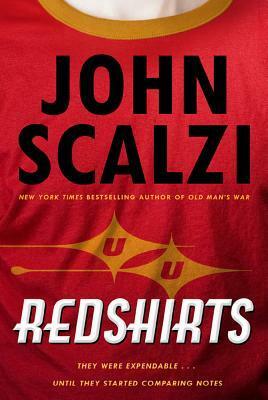 ‘Redshirts’ by John Scalzi is a comedic science fiction tale involving time travel and a hefty dose of crack. Even those who’ve never watched Star Trek (or maybe just the latest set of movies staring Chris Pine etc and nothing else) will get a kick out of this book. Ensign Andrew Dahl has just been assigned to the Intrepid, a flagship of the Universal Union that seems to have quite a high turnaround of staff. It’s not that they can’t hack the hours or the work involved, no… they just seem to get killed on missions – especially if they’re low-ranked and happen to be near the ship’s captain, the chief science officer, or the good-looking Lieutenant Kerensky. Ensign Dahl is assigned specifically to the Xenobiology laboratory, but the other workers there seem to mysteriously disappear just before certain members of the crew enter their lab. And parts of the ship seem to always blow up when they enter some kind of battle against alien forces. And the previously mentioned ship’s captain, chief science officer, and good-looking Lieutenant Kerensky always survive through whatever happens to them without getting a scratch. Or if they do, they’re somehow cured within hours, even when it doesn’t make sense. Or especially if it doesn’t make sense. Ensign Andrew Dahl puts two and two together, comes up with a crazy idea that could just sort out this crazy situation, and drags his new friends along in hopes of saving their lives. Because while this may be fun and games to some out there – he’s just a redshirt. And that means he’s very, very disposable. This book was utter crack – in the best way possible. Thankfully it also had what a lot of cracky writing doesn’t have, and that’s a very good writing voice and tone, with parts that make you laugh out loud and have trouble believing it’s what’s actually written in front of you, and all you can do is keep reading as fast as you can. Whilst it does have good character voice, Scalzi is a little light on the character voice, description, and description in general, which made it a little hard to know the characters, recognise them by dialogue alone, and visualise the scene. He gets away with it as the book is light-hearted and amusing, but it would have been good to really feel something for the characters throughout – or perhaps not, as any kind of connection to a redshirt is only asking for your heart to be trampled on by the end. Perhaps this was the point – it’s not like we know these characters that well through a tv show. At the end there are three codas that take up almost one hundred of the three hundred pages within. The first is written in first person by one of the even smaller characters in the novel, and it adds a whole lot more to the novel in general. The second coda is written in second person, and the third- well, you can probably guess what I’m about to say. Everything about this book seems to take such a different approach to novel writing in general, and I can’t think of many others besides Scazi who could pull it off. While the ending annoyed a lot of people, the inclusion of it in general made the whole piece memorable. All in all, this is a fast, very enjoyable read that I rate up there with ‘Ready Player One’ – something you can’t help but recommend to everyone because it’s just so much fun. P.S. The audiobook version is read by Wil Weaton, and apparently utterly hilarious. It’s available on audible, and I suggest you get it. This review was originally posted at SentientOnline on the 17th November 2012.